Pool algae – we all know that it turns the water green and is a pain to clean, but what exactly is it? Is it dangerous? Is it a plant or bacteria? Most importantly, how do you get rid of it? If you are looking to become a Certified Pool Operator®, you will need to know the answers to these questions. Let’s go over the basics on getting rid of the gunk. First things first, what exactly are pool algae? Algae are single-celled plants that are a pool owner’s worst enemy. There are several thousand species that grow and reproduce in water. Some species reproduce very rapidly and can change a pool’s water green within a single day. What many people aren’t aware of is that algae aren’t only green, although that is the most common type. Common pool algae are, green, yellow, and black. Yellow algae is typically the most difficult to control while removing green algae is more manageable. Black algae forms in areas of low circulation in the pool like the walls and deep corners. 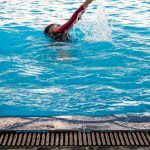 While a big part of your job as a Certified Pool Operator® will be learning the many methods of removing algae from a pool, learning what fosters its growth is a good jumping off point for those about to begin training. All of the nutrients that pool algae require in order to grow are present in pool water – carbon, hydrogen, oxygen, nitrogen and phosphorous. Nitrogen and phosphorus also enter the pool from people and the environment including cosmetics, dead skin, soils, fertilizers, dead insects, and bird droppings. Algae will then digest and store the phosphorus. While algae can make a pool look toxic, it surprisingly isn’t in itself harmful to humans. Algae as an organism isn’t dangerous to humans but it can harbor bacteria growth which certainly can certainly harm someone. However, it does pose other risks. Pool algae create slipping hazards when it is present on wet deck areas. Also, if it is growing on the floor of the pool it could cause someone to slip into deeper water. It clouds up the water which can make it difficult to see a potential drowning victim. Unfortunately, a Certified Pool Operator® doesn’t have complete control over the prevention of algae. This is due to the fact that sunlight, temperature, and humidity are major factors in algae growth. However, there are some ways to disrupt the growth of algae. For example, you can insist that all pool users shower before entering the pool or spa, as this washes away dead skin cells and cosmetics that help algae grow. Proper filtration, proper water circulation, elimination of dead spots, and constant levels of disinfectant can manage algae growth as well. You can also prevent pool algae with routine super chlorination of the water as well as regularly brushing the floor and walls of the pool. Algaecides work to both prevent and treat pool algae. Commercial pool facilities install automatic chemical cleaners, feeders, controllers, and probes to keep the pool disinfected. Facilities without these mechanisms are at a much higher risk of being affected by pool algae. There are many variations and brands of pool algaecides and learning how and when to use them is key. Learning how to control and balance these chemicals is a large part of Certified Pool Operator® training. Keep in mind that this is just the basics on pool algae. In order to learn the rest and become a Certified Pool Operator®, you need to take the best courses available. You can learn from the experts at Pool Operation Management about pool safety and management. The CPO® certification class is a great start to becoming a pool expert. Pool Operation Management’s award winning CPO certification courses train you how to properly operate a swimming pool or spa facility. Our two-day courses offer a wealth of information and training in everything from pool chemicals, to energy conservation to risk and liability. 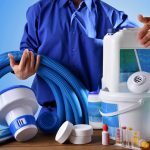 For the very best in pool operation, contact us today.